Sometimes my battery turns on in cooking mode in such a way that I just don't feel like coming out of the kitchen. I was really really in a good cooking mood today.. The menu for today was undecided but once when I got into the kitchen one by one things started playing in my mind and I got on to prepare them.. Initially I was just about to make Achari Gosht and Baghara Rice. Then I thought to add Sepu veg. Later on saw this big chillies lying in the veg compartment of the refrigerator. Thought to use it up too. Then felt like eating tandoori roti along with achari gosht so came up with that too.. Ultimately it was sweet that was only left. 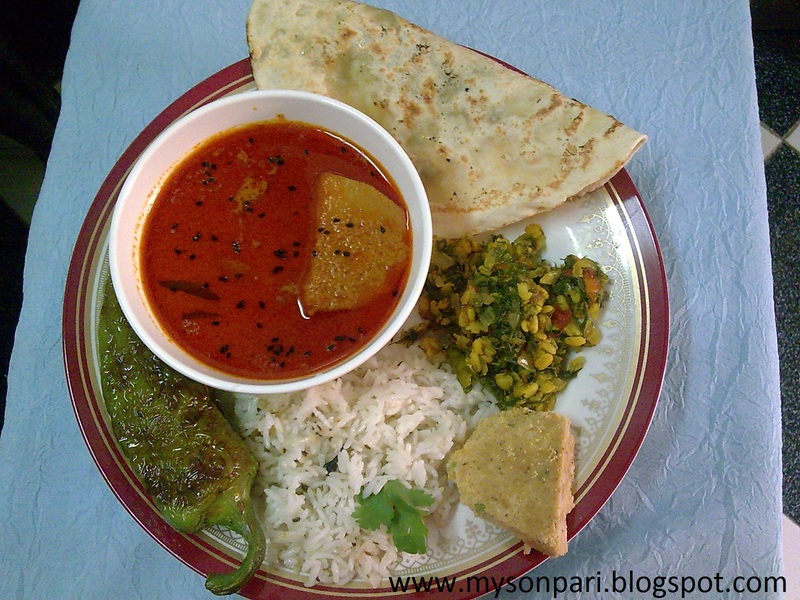 What better than mohanthal which I wanted to eat but it never came out well with me. Today mom helped me with the sweet and it came out exactly the way I wanted it to be. Actally I had eaten perfect mohanthal during my home science days. I had this guju friend who made perfect mohanthals.. I instantly became a great fan of this sweet. However I could never myself prepare it... I always cherished this desire to make perfect mohanthals but it always became soft whereas mohanthals are lill bit on the harder side. Today they were amazing, and I really love my mom for this.